Profile: The new, state-of-the-art Forensic Science Department includes classrooms, teaching laboratories, research laboratories and offices. 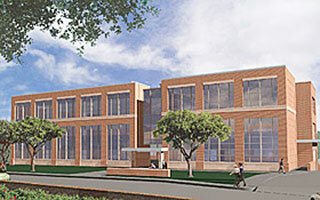 The classrooms are shared between departments and reside on the first floor along with the teaching labs. The lab module allows for future growth in a systematized way. It also allows labs to be reconfigured with more flexibility. Lab support spaces were kept close to the labs for further efficiency. Services: The technology design to support voice, data, and video applications, which involved the development of detailed drawings, technical specifications, communications construction budgets, bidding, evaluation, and construction administration.